These will be the go to floats for 2013! A very popular commercial water float with a wire stem and high viability hollow bristle, the perfect float for choppy conditions or when the water is towing. The float is very stable pattern and also extremely versatile. It is Suitable for fishing for silver fish as well as carp with maggot, pellet, meat or corn. J Range colours but gloss paint to seal body. Perfect for fishing for all species on today’s commercial fisheries or still waters. It is a very adaptable float and is also suitable for use on slow moving rivers. 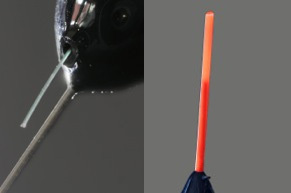 The carbon stem and hollow hi viz bristle makes it the ideal float for using caster or maggot but is equally at home with pellet sweet corn and meat. Our new silver fish float for al the delicate work. With a cane tip and carbon stem this float is perfect for roach fishing and then in inter it’s the perfect float for F1’s on commercials.